This is the site of the holy well of Walstan. Legend has it that his body rested here before its final journey to Bawburgh church. 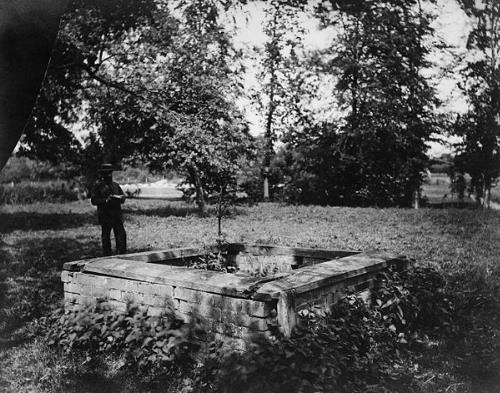 The well was a centre of pilgrimage and its waters are reputedly a curative for scrofula - a disease affecting the skin of the neck. The medieval well has been replaced with a modern brick construction. One of the wells said to have sprung up where the body of Walstan rested on its journey to Bawburgh in 1016; this, the most holy, was a centre for pilgrimage and the water was sold in Norwich as a cure for scrofula up to this century. All that can be seen now is a modern brick wall in form of a square, enclosing a round cement pipe full of green water. (S1) shows a cover has now been erected over the well. Department of the Environment. February 1986. The best summary of all the references to St Walstan is in ref (S2). Armstrong's Diary for 22 November 1868 says that it was the moss, not the water, from the mill that was held as a curative. E. Rose (NLA), 9 September 1997. E. Rose (NLA), 6 March 2004. --- Newspaper Article: 1988. Eastern Daily Press. 30 May. --- Publication: Twinch, D.. 1989. Walstan of Bawburgh. --- Monograph: Twinch, C.. 1995. In Search of St Walstan..
--- Publication: Cox, J. C. 1911. Country Churches: Norfolk. Vol II. --- Archive: Ordnance Survey Staff. 1933-1979?. Ordnance Survey Record Cards. TG 10 NE 9. --- Publication: Dutt, W. A. 1949. Norfolk. --- Publication: Taylor, R. C. 1821. Index Monasticus. --- Archive: Clarke, R. R. and NCM Staff. 1933-1973. Norwich Castle Museum Record Card - Medieval. Bawburgh. <S1> Newspaper Article: Eastern Daily Press. 1. Eastern Daily Press. 7 February. <S2> Unpublished document: Gill, M.. The Saint with a Scythe..
<S3> Article in serial: Halliday, R. 2003. St. Walstan of Bawburgh. Norfolk Archaeology. Vol XLIV Pt II pp 316-325. p 323.